Apparently the supposed $590 million collective sale of Thomson View Condominium has stalled after 13 owners lodged objection to the deal. It was reported that the Strata Titles Board has issued notice of a stop order yesterday. This will take effect on Jan 14. Such orders are made only if mediation is unsuccessful. There have been 3 rounds of mediation for Thomson View. One of the issues raised by the 13 objectors is believed to be the sale price (surprise, surprise! ), which they believe undervalues the development. As the Upper Thomson MRT station - part of the upcoming Thomson Line - was announced during the site's tender period, the objectors believe they should be getting more for the site as the MRT station will be near by. The majority owners of the 255-unit Thomson View will now have to make an application to the High Court for further adjudication. The stop order raises concerns that the collective sale process for Thomson View may result in a drawn out legal battle due to the large size of the development. The 540,314sqft site in Upper Thomson Road was bought by a consortium led by developer Wee Hur Development and private equity investment company Lucrum Capital for $712psf ppr in September last year. It was the fifth largest collective sale made. Owners of Thomson View units - ranging from apartments to townhouses and shop space - were expected to receive gross proceeds of $1.62 million to $3.59 million. So the Thomson View Condominium collective sale has the making of another Horizon Towers saga, which dragged on for more than 4 years. So would this be another case of only the lawyers making all the money at the end of the day? 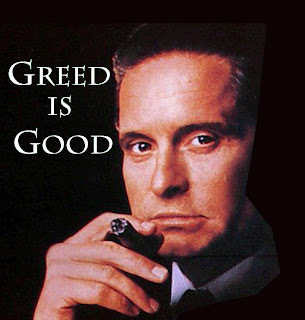 So anyone remembers what happened to Mr. Gekko at the end...? 7 comments to ''Thomson View: En bloc-ed no more..?!" At today's property market, the $712psf is not a premium price to get for an enbloc sale. What kind of replacement apartment can the seller get at today's heated property market? Thomson View condominium is due for renovations as it is old. Maybe it is better to renovate and keep the big apartments and gardens. While there is some truth in what you said, the wife and I suspect the current "dissent" is not about wanting to keep the big apartments and gardens. If not, why the ruckus only after the Thomson Line MRT station is announced? current dissent is - money no enough. So now you think they regret?